Justin Santora is back with a few new prints for his loyal fanbase. 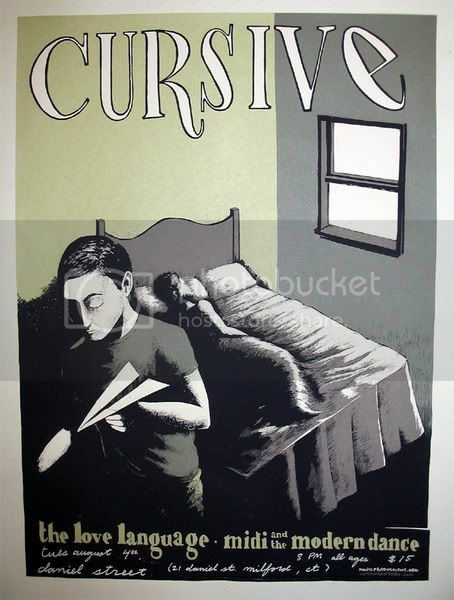 His Cursive poster is a 19″ x 25″ screenprint, has an edition of 80, and is only $20 shipped. The second (and final) edition of his Chicago exhibition poster is an 18″ x 24″ screenprint, has an edition of 40, and is $20 shipped. Grab both in the Gigposters.com Classifieds. 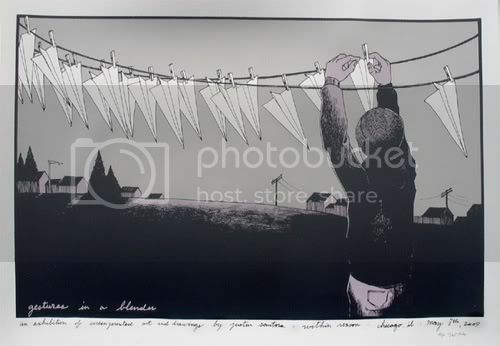 the one with the fellow hanging / drying all his paper planes is awesome. I’VE BEEN A BIG FAN OF JUSTIN’S WORK FOR A LONG TIME.SO REFRESHING TO SEE GOOD OLD HONEST SCREEN PRINTING AT ITS BEST.